I told you I was obsessed with getting pictures of Cate with pumpkins, which epitomize fall to me. So here’s another try. 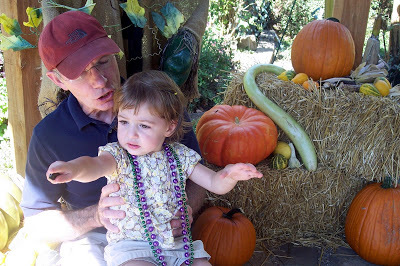 Cate wasn’t so sure about sitting on the straw with her bare legs, so her great-uncle Rick sat down with her. I’m not sure what’s she’s showing him, but I know she was ignoring my requests to “cheese.” These pumpkins were at Patti’s, a delicious restaurant that sits between Lake Barkley + Kentucky Lake in Grand Rivers. We met my mom and Rick there yesterday and then showed him around the lakes. Oh gosh…we used to go to PAtti’s all the time. I don’t think I’ve been there in about 20 years.